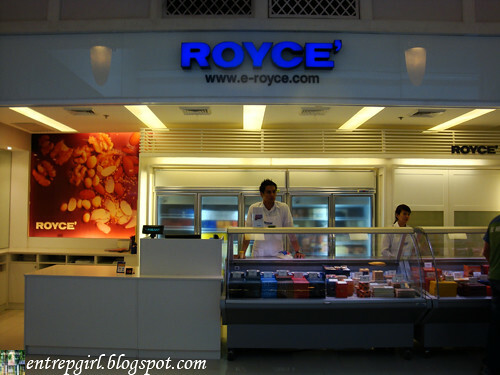 I've been hearing about Royce' for a time when they finally opened up a local branch in Rockwell. When I first visited the place, I was shocked at the prices. The only available ones were the Nama Chocolates (P580), all the others have been sold out as of that instance (I wondered if that was a ploy to make customers think that their products are good enough to be sold out, but succeeding visits proved that it was just an isolated case of under stocking). With one eyebrow higher, I began my internal debate about the rationality of expending over 500 bucks for a small box of chocolate. With eyes now closed, I pointed to the White Nama Chocolate, walked over to the counter and plunged right into saying goodbye to Ninoy. Watching the crew wrap the chocolate in an insulated bag complete with an ice pack, piqued my interest. Surely this chocolate must be something else for it to be treated with such great care. As soon as I got in the car, my curiosity got the better of me. The box contained 20 mini bars (my mind started to calculate how much was it per bar -- ugh, this better be good). After taking a few shots amidst the bumpy ride, I opened the package and cut a slice. The first word that comes to mind as I took a bite is "Heaven!". The explosion of the cold, creamy chocolate leaves something to erase all thoughts until you've finished the little bar. In hindsight, I began to analyze the fusion of flavor and emotions in that single act of ingestion. The first thing you taste is the powder, then comes the cold sensation and before you begin to decipher the taste, the chocolate begins melting in your mouth, and that's the time you identify the sweet goodness of white chocolate, and wonder how in the world someone makes a chocolate this unbelievably good. The silky texture makes you think of butter and before you start counting fats and calories, you are pulled by its force to take in a couple of more bites, and then some. After a dozen bars, it began to be too sweet for my palate. I'd appreciate it more if I were to save it and eat it for another time. You can't let it wait for too long though, it expires rather quickly and is really best eaten fresh. 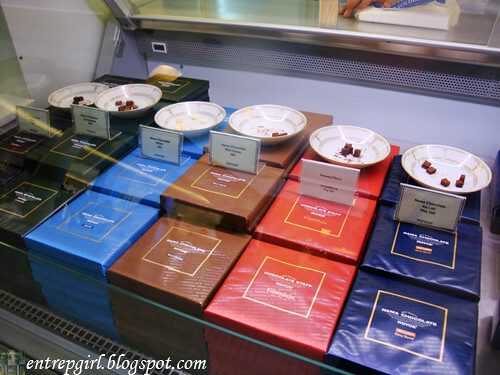 I also tried the Champagne Nama Chocolate, and I found it even more heavenly than the White (maybe because I'm rather fond of chocolates with wine, champagne and rum inside). 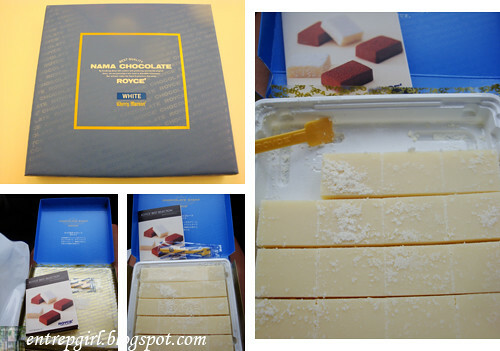 This one I can continuously consume until I finish the whole box. 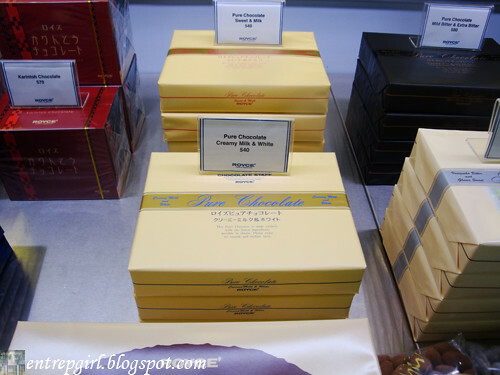 The flavor isn't too sweet and the champagne does not come on too strong like usual liqueur filled chocolates. It's like my own personal haven, that befits me depending on what I need. It can act as a comfort food set on letting you forget the stresses of the day. It can also be a rewarding toast to an accomplished task or goal. This melt-in-your-mouth confection leaves a lasting impression, enough to make you forget about belt-tightening in times of global recession. Other variants are the Au Lait, Bitter and Mild Cacao. 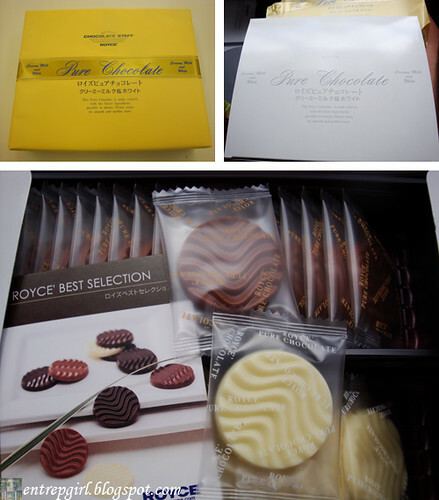 There's also the Pure Chocolate (P540 / P580), a combination of two flavors in one box. 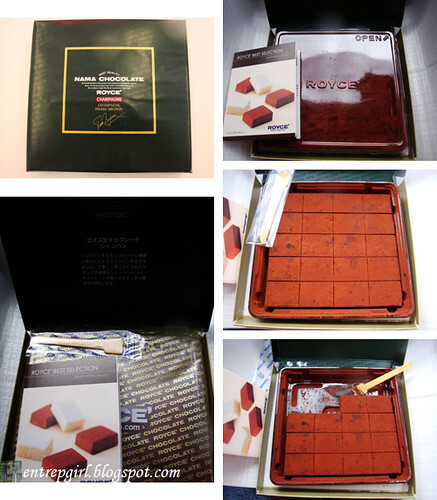 There are 20 individually wrapped, thin, round pieces for each chocolate flavor. 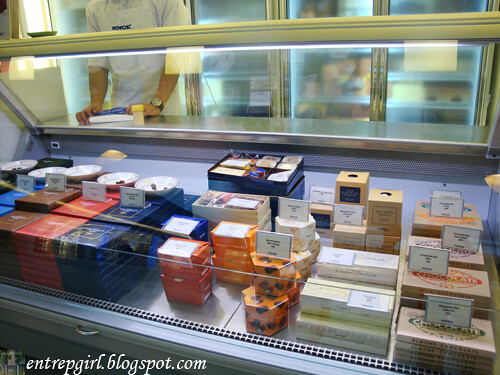 I opted to try the Creamy Milk & White Chocolate (P540). Though it doesn't melt immediately as does the Nama, the same smooth and creamy texture can be expected from this variety. This is actually less sweet than the Nama. I think it's the thinness and fineness of this chocolate that leaves you yearning for more. Other variants are Sweet & Milk (P540), Caramel Milk & Creamy White (P580), Venezuela Bitter & Ghana Sweet (P580), and Mild Bitter & Extra Bitter (P580). 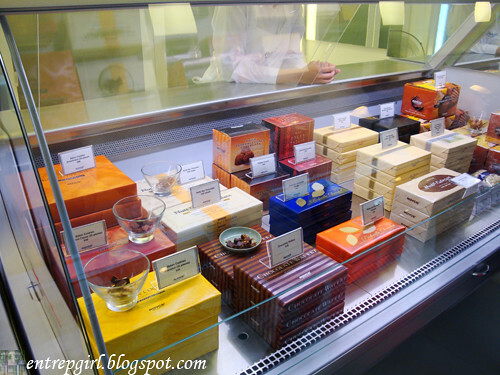 Other popular selections are the Potato Chip Chocolate (P540) large (P990), salty, crispy chips dipped in smooth milk chocolate; the Bar Chocolate (P250), their original bars in classic variations: dark, white, milk, creamy milk, almond and rum & raisins; the Truffe Chocolates (P450) in Orange, Kirsch and Praline variants; and the Prafeuille Chocolate (P540) in Caramel, Honey and Coffee. There are a lot more as can be seen in the display glass cases below, so better head on there to discover them. This coming Valentine's, this would surely be a big hit with your loved ones, a box or two will earn you brownie points. This bag alone strapped on your hand, will cause your wife's or girlfriend's arms to wrap around your neck. Oh.. I see you've added my bogcess. Can you add my other blog aswell? If its no biggy. yummy cho, I love them but need to eat less. 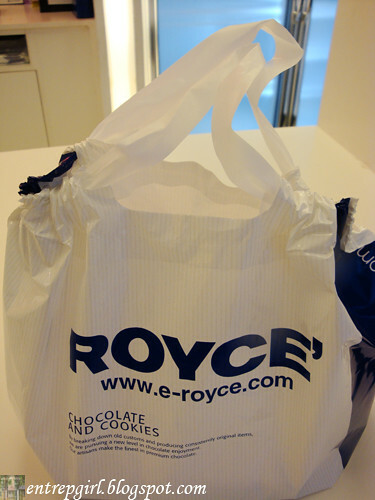 Royce is love! I've been smitten ever since I took my first bite of a piece of Champagne Nama. I've only been able to try the Au lait and mild bitter since, but I'm still left wanting for more.